Time for a Better IC: After "auditioning" the single OPAMPs, I've decided to use a good 4558 in the Liquid Drive for better all-around sonic performance, in this case a Burr Brown OPA2134PA. You can also try all the other 4558-types, like the JRC 4558D and 4558DD, Burr Brown OPA2604, Texas Instruments RC4558P and several others. Stabilizing the IC: Since this circuit utilizes a dual IC, but actually uses only one of the two internal amplifiers, we need to stabilize the second unused amplifier. In order to do this we'll tie pin 5 (non-inverting input 2) to ground, and attach pin 6 (inverting input 2) to pin 7 (output 2). More Treble Response: For more treble response in the circuit, specially tailored for my modified Fender Telecaster and Twin Amp, I changed the 0.01�F input capacitor to a smaller value, in this case a 0.0033�F. Asymmetric Clipping Diodes: I personally prefer the sound of asymmetric clipping. For the Liquid Drive I chose to use 1N270 Germanium diodes for their warmer, more throaty response compared to Silicon diodes or LEDs. They're also a little more squishy and compressed sounding than Silicon diodes or LEDs, which makes them sound more like tube distortion to my ears. 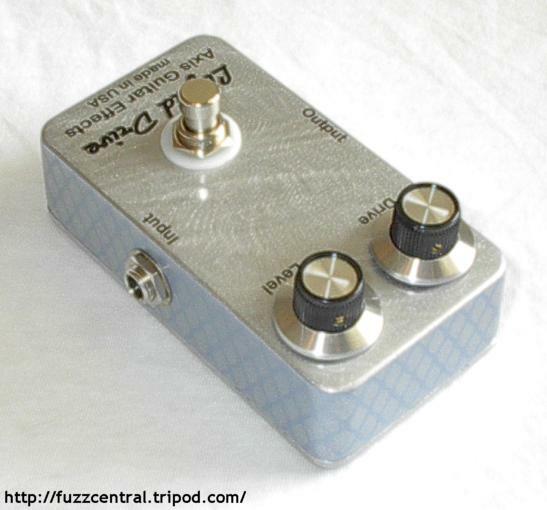 Using asymmetric clipping also enhances the harmonics and boosts the output of the circuit. The only drawback is that the drive range is decreased a little, but we'll make up for that in the next mod! More Gain: In order to recover the gain range lost by using asymmetric clipping, I've lowered the 4K7 resistor on the 3rd lug of the "Drive" pot to 3K9...not a drastic change, but it does increase the available drive range. More Low-End Response: To get a little more low-end response out of the circuit, I increased the value of the 0.047�F capacitor that's attached to pin 2 of the IC to 0.068�F. Increased Output Level: In order to get a little more output from the circuit, I've used a 100K linear taper pot for the "Level" control. The linear taper pot will allow more output sooner in the rotation of the pot, as opposed to a standard audio taper, where all the useable output is in the 2 o'clock to 3 o'clock range. The linear taper takes some getting used to, but I think it's better to have that extra output sooner in the rotation range. The linear taper pot is LOUD at 11 o'clock. Use Non-Polar Film Capacitors Instead of Tantalum: In order to get more clarity from the circuit, I've replaced the two 1�F Tantalum capacitors with 1�F non-polar AVX boxed metal film. They're larger than the tants, but I think their better sound quality is worth making a little more room on the circuit board for them. Some Other Notes: The "Drive" pot in this circuit really needs to be a REVERSE AUDIO TAPER for the best control "feel" and distortion range. Using a standard linear taper pot will bunch all the distortion up at the end of the pot's rotation, severely limiting the ease of adjustment. 500KC (reverse audio taper) 16mm pots can be purchased from Small Bear Electronics. 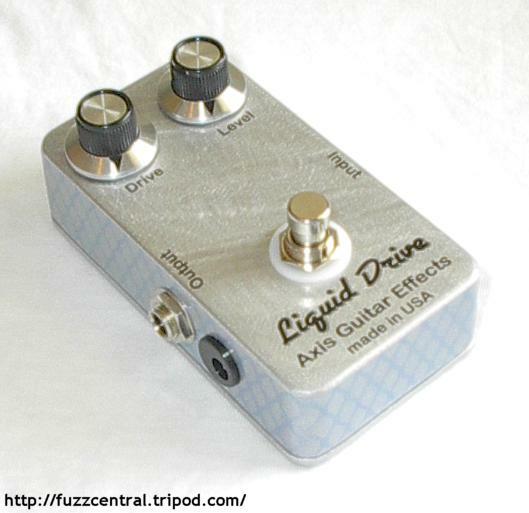 Here are some pictures of the Liquid Drive. 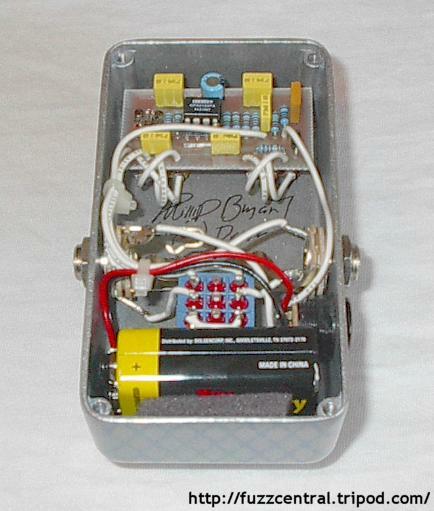 The box was given a swirl sanded top and the sides were painted light blue metallic (acrylic lacquer) and then a silver "snakeskin" stenciling was sprayed over the light blue. Click the thumbnails for the full-size image. Use your browser's "Back" button to return to this page. The link below is for the Tonepad PCB and Layout for the MXR Distortion + and MXR Microamp, which is essentially the same circuit with some minor parts differences here and there. You can easily build the Liquid Drive using this layout, but you will need to use a single OPAMP like the TL071 or Burr Brown OPA134PA instead of the dual OPAMP since the pinouts will be different.